Street Fighter Alpha was released in 1995. 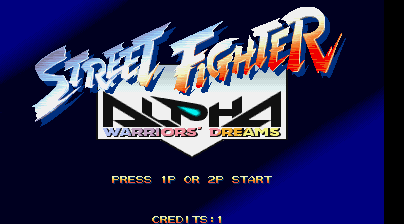 The last few Street Fighter games before it had been part of the Street Fighter II series, but Street Fighter Alpha was a totally new sequel. Inspired by the look of the Street Fighter II animated movie, Capcom created Street Fighter Alpha (known as Street Fighter Zero in Japan), which ran on the company's CPS-2 board. 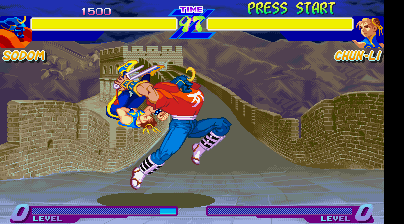 The graphics were all new with anime style sprites and a largely different cast. 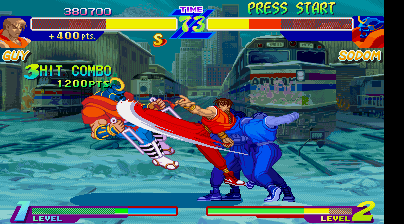 The gameplay was changed around with new features such as alpha counters and a new super combo system. 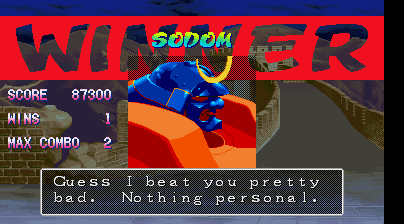 The good news for Final Fight fans was the fact that two characters from the series made an appearance in it: Guy and Sodom. They fitted into the game perfectly, with each of them having many new special moves and super combos. Guy's role in the game is to track down M. Bison, whilst Sodom attempts to get the Mad Gear gang back together again. 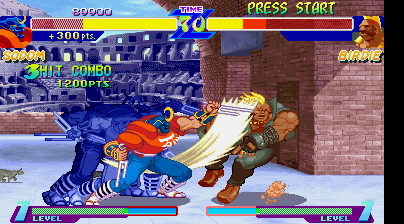 The music used on their stages is also remixed music from Final Fight. The game was the hit Capcom needed in 1995 and it was ported to the Sony Playstation and SEGA Saturn a year later. Despite how popular it was, the game was clearly rushed out, as it had a very small character roster and fighters sharing stages (Guy shares Ryu's stage, whilst Sodom share his with Bison). Capcom immediately got to work on a sequel. 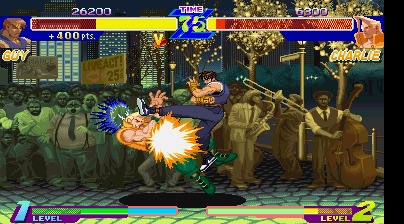 The game has also appeared on the GameBoy Color, mobile phones, Playstation 2 (as part of Street Fighter Alpha Anthology) and Playstation Network as a downloadable title.